We are thrilled that our agency’s research was part of of two big reasons for optimism in book publishing over the past two weeks: The American Booksellers Association “Winter Institute” and Digital Book World. 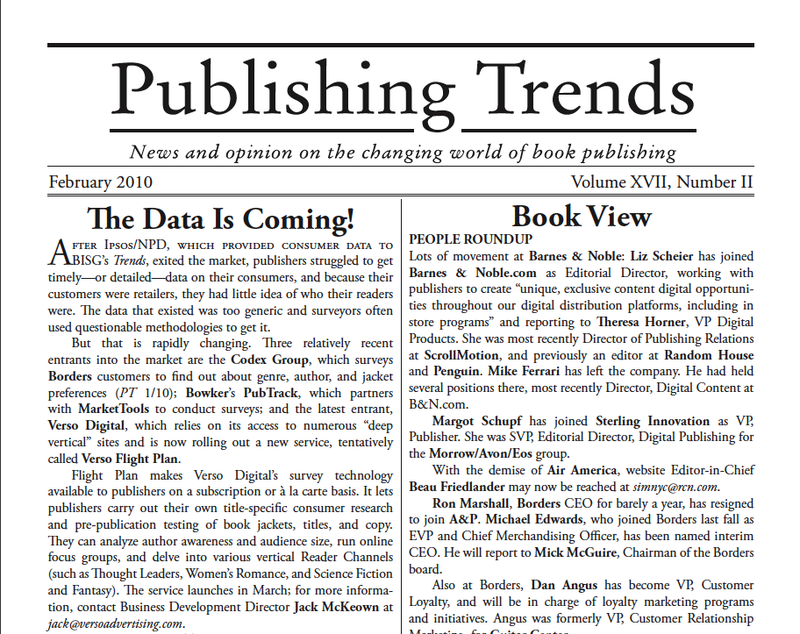 Both conferences revealed crucial data from book publishing’s recent-past and evolving present, and both generated actionable ideas for our industry moving forward. Here’s a link to our slides from 2012 Winter Institute. Here’s a link to our slides from 2012 Digital Book World. 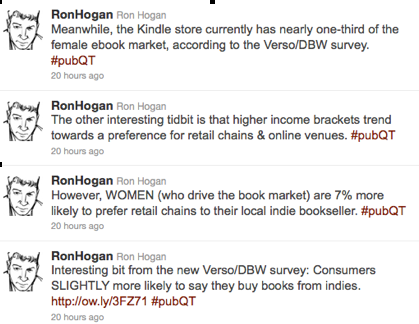 For links to news reports related to the latest Verso Survey of Book-Buying Behavior, click here. Shelf Awareness reports on our third annual survey of book readers, focusing on the effect of the Borders closing on booksellers. Verso Digital will be presenting the full results of this survey and its implications January 19, 2012 at the American Bookseller Association Winter Institute and January 25, 2012 at Digital Book World. For reference, here are links to the first survey (version presented at the ABA’s Day of Education at the 2010 Book Expo America) and the second annual survey (version presented at the 2011 Digital Book World conference). We are grateful to Digital Book World for allowing us to present the latest survey results at their 2011 conference. Some of the results were more than surprising and the news was picked up throughout the industry and around the world. Click here to read Publishers Weekly on what the results say about the role of libraries in discovery of both print and ebooks. Click here to read Shelf Awareness on our presentation at Wi6 and the “Hybrid E- and Print-Book Market.” …And here to read Shelf Awareness reporting on how Verso’s survey complemented other research presented at DBW by Bowker and iModerate. …A few days later Shelf Awareness reported again on the hybrid market, going deeper into the implications of the survey. Click here to read Bookselling This Week on the common themes that emerged from all the surveys presented at DBW. The recent Digital Book World conference was one of the best run and most useful conferences we’ve been part of in recent years. It did a great job of airing necessary conversations and forging new ideas about the present and future of our industry. We couldn’t have picked a better place to debut the initial results of our Consumer Survey. This is an industry that’s ready for hard data. There has been a lot of talk going on related to the conference over the last week, easily trackable with Digital Book World’s own link round-up, here. Pete Nikolai uploaded the Survey slides to Business Week’s “Business Exchange” site, with brief commentary. 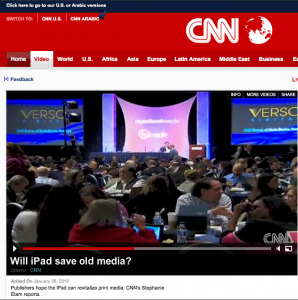 Verso Slides Up on CNN! Over 27% of e-reader owners are unwilling to pay more than $9.99 for e-books, while an equal number, 28%, are willing to entertain a range of prices up to $20.00. (The typical Amazon price-point for Kindle e-book sales is $9.99.) 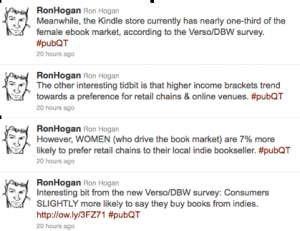 Further, over 37% of e-reader owners have yet to form a firm opinion about e-book prices. The results are based on Verso Digital’s 2009 Survey of Book-Buying Behavior, the full results of which will be presented at the upcoming Digital Book World conference, January 26-27 at the Sheraton New York Hotel & Towers in New York City. Conducted in two waves during November and December, 2009, the survey polled 5,640 book-buying respondents, weighted to mirror the U.S. adult population. The results are statistically reliable within a 1.6 percentage-point margin of error, at a 95% probability level. Could it be true that current e-book users are willing to entertain more flexibility in e-book price points than it first seemed? Over 28% of e-reader owners have used unregulated file-sharing services, such as RapidShare, Megaupload and Hot File to download at least one e-book within the last twelve months, and 6% have used such services to download ten or more titles during this interval. The Survey further reveals that questionable downloading, while affecting all age and gender brackets, is concentrated disproportionately among younger male readers. Among males aged 18-34, over 45% report engaging in such downloading activity within the past twelve months. Nearly 13% have downloaded ten or more e-books from file-sharing services, more than twice the level of the Survey population as a whole.